Housing for Seniors 62 years of age or older or disabled of any age. All of our available units are HUD subsidized for qualified applicants. Rent based on 30% of adjusted income and includes all utilities. Large community room with coin-op laundry service. Ground level. Private. Pet friendly. Located in the quiet rural town of Tieton, WA. Pear orchards and streams surround this peaceful, small property. 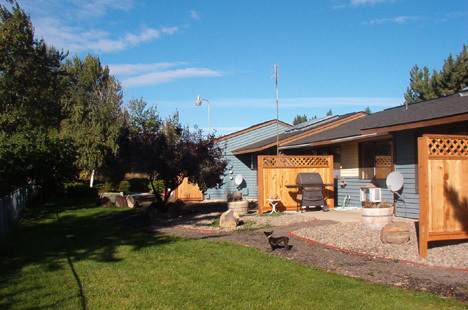 A short distance to the city of Yakima for shopping, restaurants, churches and freeways. Gorgeous community facilities with wood stove and kitchen. Patio area with barbeque. All of the apartments are cottage-style, single-level apartments with gardens and and some back yards!! Very cute and homey. Beautiful grounds with lots of flowers. Walking path along the canal and around the orchard. Emergency pull cords in units to alert neighbors. All units HUD subsidized, so qualified applicants will pay only 30% of their income for rent.